1. Soo AE Pure Brightening Sheet Mask: I bought this Korean sheet mask from Club Clio awhile back and finally slapped it on my face earlier this week. 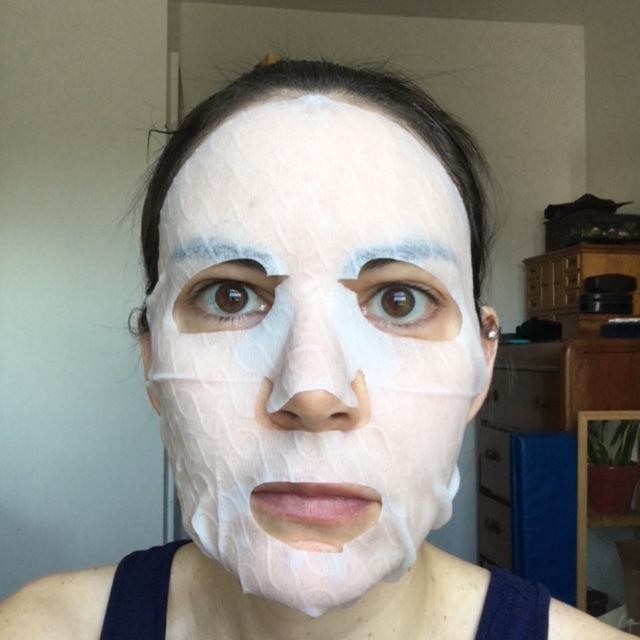 Twenty minutes later, after having scared my husband by texting him the below photo (as you do), I removed the mask and patted the remaining serum into my skin. The result felt a little sticky for a bit, but like a dry sticky feel, if that makes any sense. It’s hard to say if this vitamin-infused mask had any legit brightening effect after one use, but I it’s so fun treating myself to sheet masks, and when they’re so cheap it’s hard not to try them! 2. 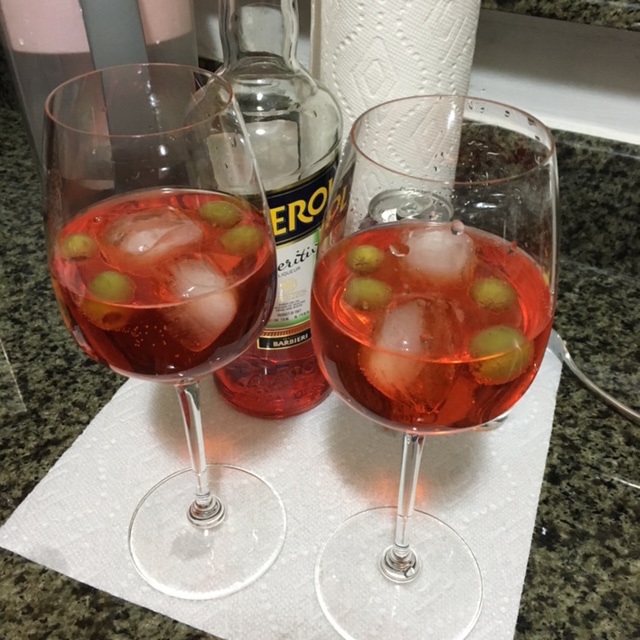 At-home Aperol Spritz: I know I’ve posted about this cocktail before and how it reminds my husband and I of our honeymoon in Italy, but we recently made some at home so I wanted to share a pic. The simple recipe: three parts sparkling wine, two parts Aperol, and a splash of club soda over ice along with your garnish of choice (orange slice or olives). The first time in Venice that we were served spritzes garnished with olives we thought it was weird, but we ended up being into it. So we made our own with those little green salty treats! 3. 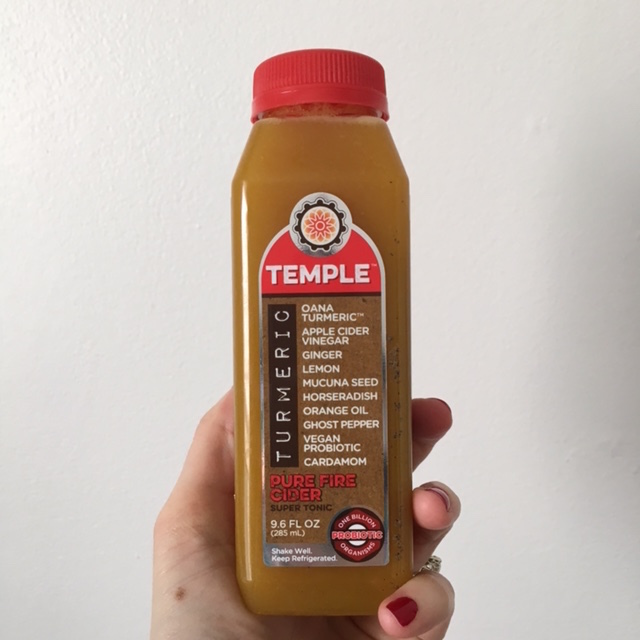 Temple Turmeric Pure Fire Cider: I’ve talked about turmeric drinks before, and seeing how hugely trendy the ingredient has become we’re already starting to seeing a whole lot more of it in everything from food and drink to beauty products. I spotted Temple’s new drink in my local grocery store and I just had to try it. The ingredient list sounded intimidating—ghost pepper? mucuna seed?—but the drink turned out to be delicious. Intense, but enjoyable nonetheless. For me, the intensity came more from the apple cider vinegar than anything else. I actually can’t remember how much it cost, but I think it was maybe around $5 for an 8 oz bottle. So…not cheap, but it’s an occasional health booster treat. 4. 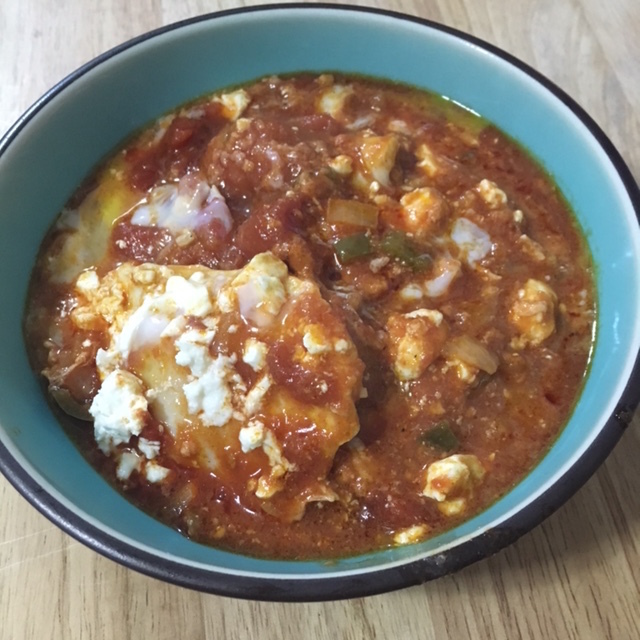 Shakshuka: I pinned this recipe from Smitten Kitchen a long time ago, and I FINALLY got around to making it for the first time this week. It’s a dish of North African origin and is basically a warm, spicy tomato stew with fried eggs and feta cheese cooked on top. The dish is really easy to make and doesn’t involve a lot of ingredients or prep. I definitely destroyed the eggs as I was spooning the finished dish into bowls so my pic looks like a hot mess, but this stuff tasted SO GOOD. I highly recommend dipping buttery toasted bread into it, too! Shakshuka will definitely be a new dinnertime staple for us. 5. 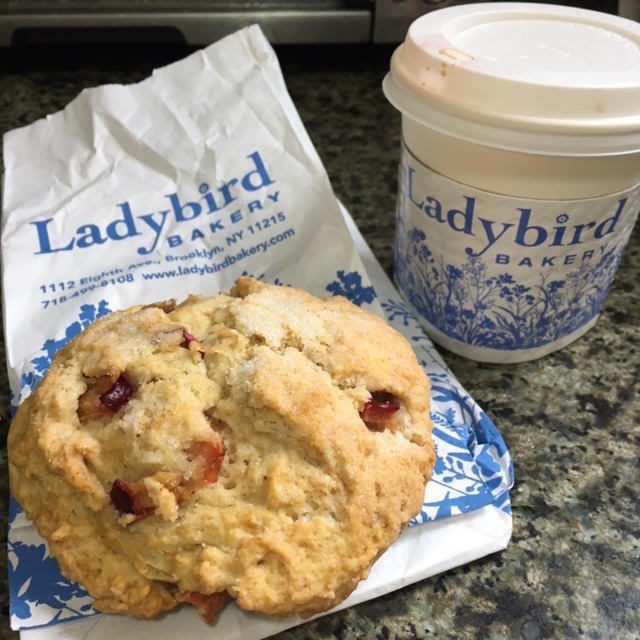 Ginger Plum Scone from Ladybird Bakery: as I was out and about yesterday running errands and walking a mile home to escape a verrrry slow G train, I found myself walking past Ladybird Bakery on 8th Avenue in Park Slope and thought I’d stop in for a treat. First I eyed the cupcakes, but I settled on a ginger plum scone and a cappuccino. Yum! And their graphic design is so adorable. Ladybird is a great neighborhood place for some sweet treats. Thus ends this food and drink-heavy Friday Five. Enjoy your weekend!